Today’s parents compete with each other as to who will be the most protective of the children. Over recent years, anxiety has become the most desirable quality for the “good parent.” The message is: the more we prevent our kids from engaging in activities that might injure them, the healthier a generation we are raising, one which is safeguarded, protected and overly supervised. “At the heart of the obsession with safety,” argues Hannah Rosen in her article “Overprotected Children” (published on line in the e-journal Alachson, 2014), “is the basic assumption that children are just too fragile, and lack the knowledge required to assess risks in each situation.” Rosen’s article reviews the development of overprotection of children over the past 30 years. 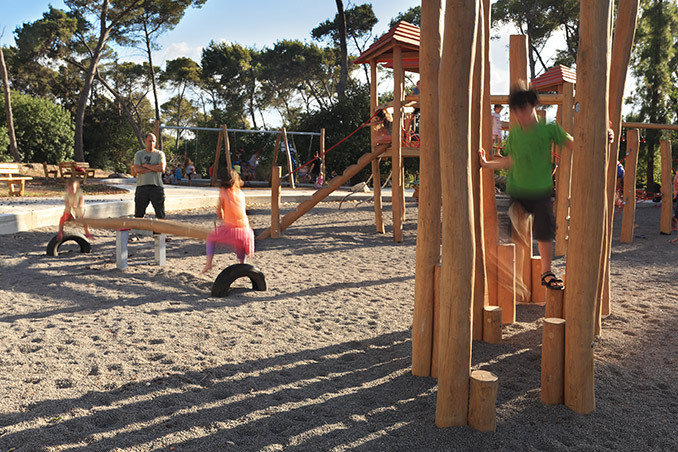 It reached a point of having lawsuits filed by parents, for example, due to their child bumping into a log and stumbling in a grove of trees in a play area. She presents a survey of playgrounds which in the 1990s became sterile and boring – safer, yes, but much less interesting. 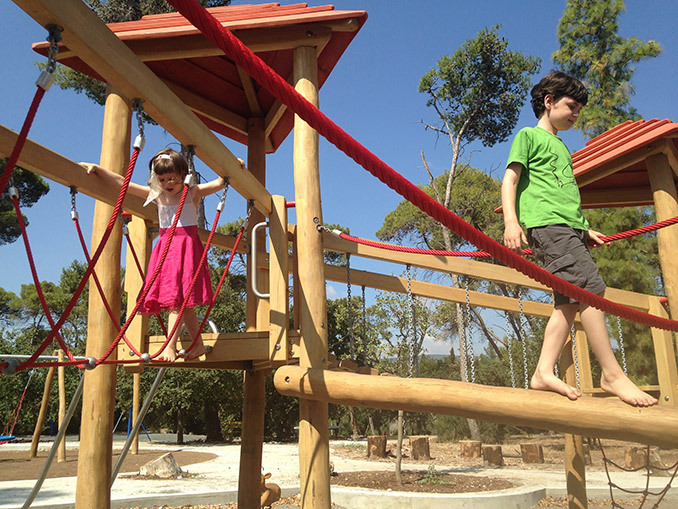 Rosen describes research studies showing that challenging play environments force children to do what frightens them, to overcome their fears and make decisions. This is a decisive part of the process of maturing and developing. Children who fail to undergo this process suffer from phobias and do not develop the self-confidence necessary for independence and not dependent on their parents. 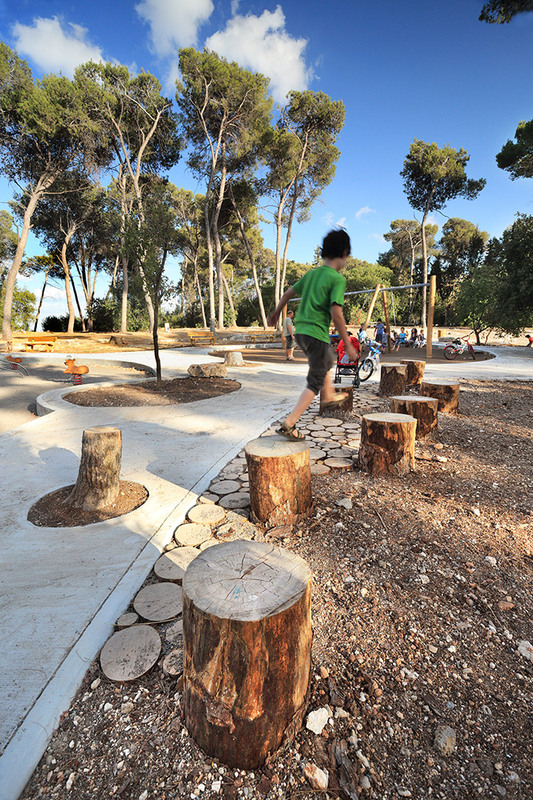 As landscape architects, much of our work involves designing for children. We have recently ben partners in the planning of kindergarten and elementary school grounds. We were surprised to be faced with the full force of the phenomenon. 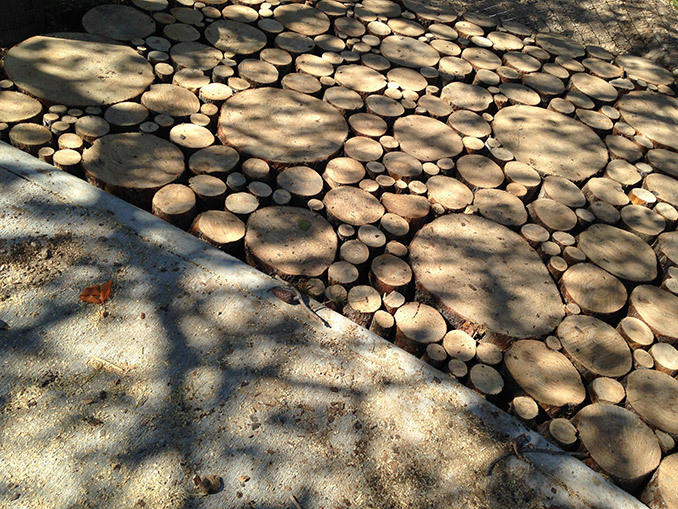 Parents demanded that we remove all of the low logs we planned for the grounds we designed, logs which formed the borders of the garden rows in the small garden plots in the schoolyards we designed. The logs, elements for play and practice in balancing, were the focus of parents’ fears that their children would fall and hurt themselves. Once we received a report from the Ministry of Education stating that the school grounds must be free of any protrusions or elements to climb on or bump into. This forced us to close down the little theatre we had planned for the yard – “The children might fall from a height from the seating walls.” But the legislation and anxiety do not stop at the school or kindergarten fence; they send their feelers into the open spaces, as well, into the places where children have a bigger degree of freedom, places which facilitate free play, experimentation and discovery. 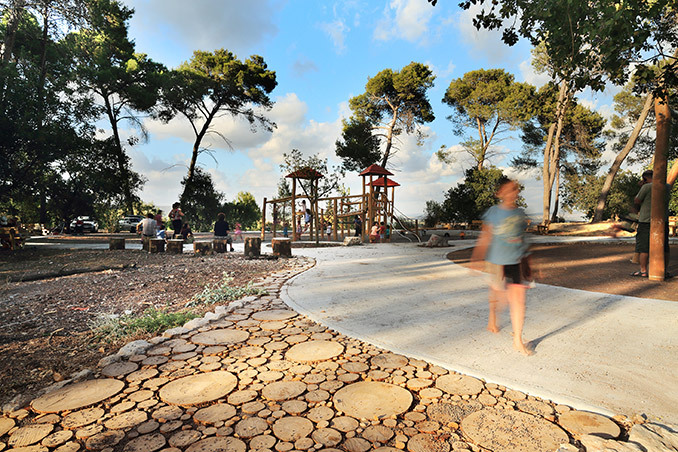 Our office recently received the commission to design Hashomrim Park in Kiryat Tivon, Israel. 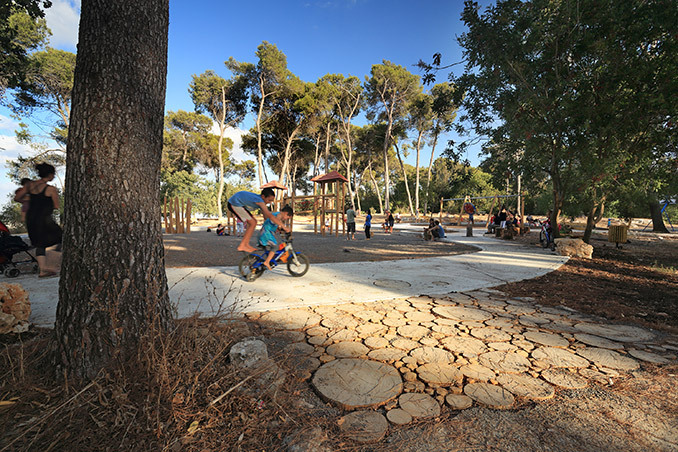 This is a long-standing playground in the heart of an oak and pine forest which had been stripped of its play installations after failure to comply with the Standards Institute of Israel’s standards. 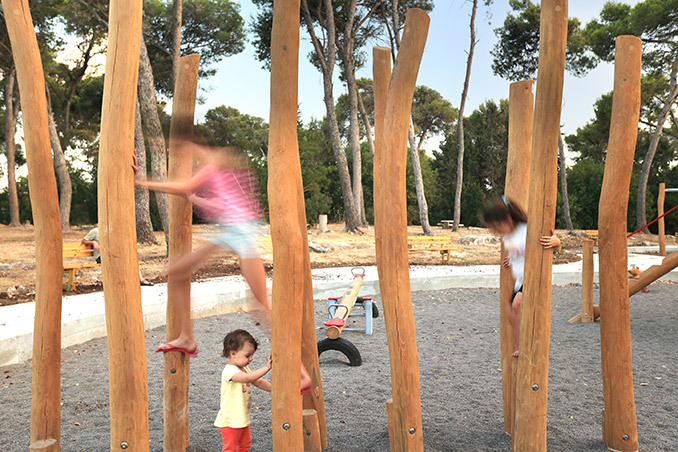 The design concept was to make maximum use of the frame of old trees in the park and use their broad shade. 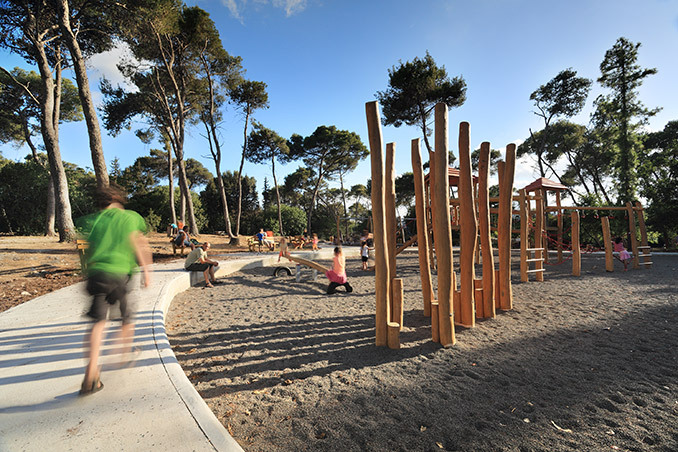 We would lead people towards the play area with paths between the trees while maintaining all of the required safety margins around the playground installations. This is why we made the pathways twist around between, near, and around the trees, taking utmost care to preserve each and every tree which all together provided immediate quality of the space and a wide shady area. There has always been tension between our children’s safety and their developing a sense of danger and exposure to challenges supporting growth and maturation. We must make wise decisions, which may sometimes mean that we must understand that “it’s impossible to create the perfect environment for our children, in the same way that it’s impossible to create perfect children” as Rosen stated. It is worthwhile taking the risk, because avoiding risk also has its price. Landscape architecture | Landscape Arch. Orna Ben-Zioni and Landscape Arch. 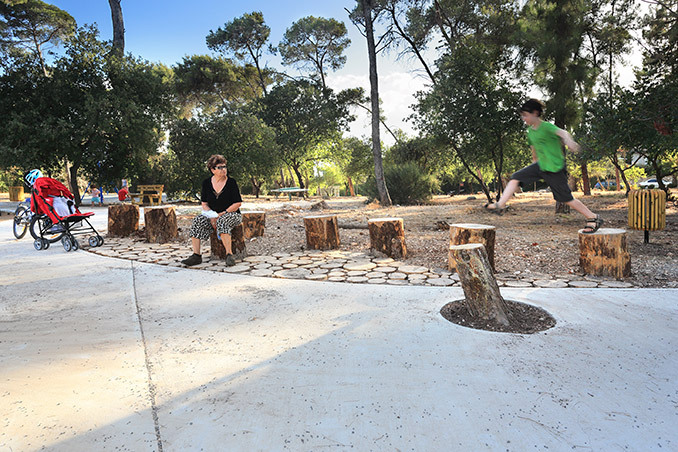 Beeri Ben-Shalom are partners/owners of BO- Landscape Architects. I cannot quote the actual piece of research, but I am pretty sure that I have read that playgrounds which look ‘dangerous’ are actually safer than ‘sanitised’ ones. 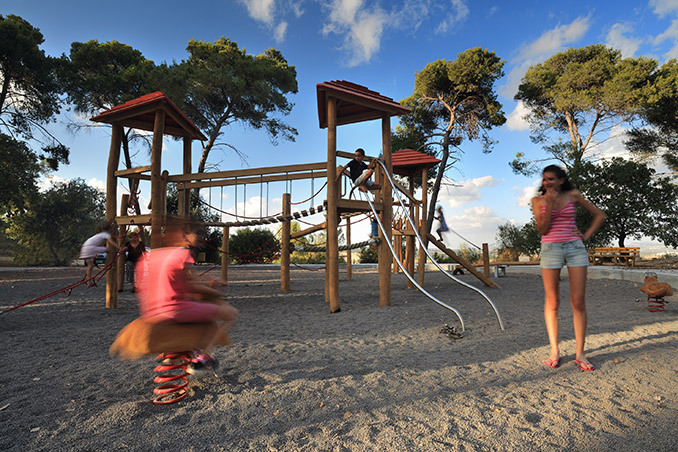 For example, the old adventure playgrounds created on WW2 bomb-sites resulted in very few accidents because they didn’t look safe to the children who then took the appropriate level of care. Can anyone else add to this?